I had to tell a woman today that my friend was dead. It had been almost five months but she didn’t know. It was five months empty because he wasn’t there. Five months wishing he still was. Five months of being reminded of him every day we would have worked together. There was still an empty space in those days where his smile should have been. It had been five months, but he was still dead. How do you tell someone that? How do you look this woman, a perfect stranger, straight in the eyes and tell her that he’s dead? Nineteen years old and he’s dead. That’s what everyone says, too. He was nice, so nice. The nicest person you could know. Always smiling. That’s one of the things we miss the most around here. His smile. He was always smiling. He’d walk in and no matter how late he was or the reason for it, he’d be smiling. He didn’t smile because everything was perfect and nothing bothered him. His life wasn’t perfect. But it was his life not ours. So when he saw us, he smiled. Around us the rest of the world, that world beyond the doors of the store, didn’t matter. The rest of his life couldn’t bother him there. So he smiled. The rest of his life couldn’t bother him. The rest of his life. Didn’t even realize how that came out. The rest of his life. Nineteen years old and the rest of his life doesn’t exist anymore. Not many people would agree with that. Not many people would do something for a friend no matter what the situation was. He would. He did. His friend was alive. It’s easy to look around and say that it seems like the best types of people are dying. Or is it simply that those deaths are the ones that stay with us. The senseless death. Those are the ones we can never forget. The tragic death. The people dying are the best types of people because they’re willing to put themselves on the line. They’re willing. Not willing to die. That isn’t their intention. They’re willing to stand up when no one else will, to step in when everyone else has put their head down. Not many people would do that anymore. Everyone says they would. You hear it all the time. I’d do anything for you. I would die for you. I’ll be there for you no matter what. But what does that mean today? Today that means I’ll do anything for you that won’t take too much time or energy or inconvenience me in any way. Today that means I’ll die for you until I feel the slightest bit of pain and then you’re on your own; then it’s your problem and you need to deal with it yourself. Don’t worry, it will teach you a valuable lesson. You’ll be better off if I don’t intervene. People who say that never mean it. It’s the people who are afraid to say it or the people the thought never occurred to who would be the most willing when the time comes. Words are meaningless. Words are a waste. How you live is how you are remembered. In some cases, too, it’s how you die. He was always smiling. No matter what, he was smiling. Everyone, when they talk about him, that’s the first things they all say. They miss his smile. There are endless stories about him. Endless good times. Funny stories. Almost endless. They remind me how little I actually knew about him. I barely knew beyond the smile. They knew him better, and I’d listen to every story. They all had one. I suppose this is mine. I had to tell a woman today my friend was dead. Then I had to tell her how, at least the version of how that I had heard. But I couldn’t tell it all. I couldn’t tell the story; only that he was stabbed helping his friend. Protecting his friend. Her reaction spread to me. My knees felt weak, my hands shook. My voice caught in my throat each time I tried to answer. And my eyes… everything started getting a little blurry. When I could finally answer so did hers. A while back I ran into a guy I used to work with. Hadn’t seen him much since he left, but we’d kept up a little bit on Facebook. I’d just hit that magical optimal beer level of friendliness that socially awkward introverts find themselves at where we can talk to anyone about anything and its all pure poetry and life changing conversational bonding. This is also known as, “One more beer and I won’t remember how to sit on this barstool anymore.” It’s a fine line. Being at this point in my drinking, when I recognized him I was thus uninhibited and said hi in the artificial, “Mike? Is that you?” fashion one for some reason uses even knowing full well who it is. It was. We got to talking. He’d just gotten a job at a newspaper, which surprised me since I didn’t think those existed anymore—newspapers and jobs—and he shared my disbelief. It was a small paper, but a great way to get into the business. Print newspapers may be on their way out in the sense of how they’ve existed so far, but journalism—writing—isn’t going anywhere. It’s changing shape and adapting to the evolving digital landscape, but the concept behind newspapers will not vanish entirely. And in this he was excited, not just to get a job at a newspaper, but to get into the business as he was. We talked about his brother, we talked about old times at the pet store where’d we’d all worked along with his brother’s wife before they’d gotten married and moved and had kids. At that moment we were at Gordon’s, where I spend most Friday nights due to some friends who have spent most nights there over the last five years. Ten years ago one of the owners of Gordon’s, Corey, started a small literary magazine in Buffalo called Blinking Eights. It was a simple magazine: heavy paper folded and stapled together, sponsored by local businesses like Bubble Tea and probably Kinko’s where it had been copied and put together, and given away for free from the window ledges of businesses around the city. It wasn’t long, it wasn’t fancy, but in the very first issue a short story I wrote was published. Like Blinking Eights, that story wasn’t long, it wasn’t fancy, and maybe it wasn’t even that good and Corey just needed something to throw on the last page. But Mike remembered it. A while back I got to work on a film that was shot in Buffalo. I helped out around the set for a few days, and after the last day of filming got invited out with the rest of the crew. In a drunken conversation with one of the writer/stars I told him how amazing it was that he’d done this, that they’d done this—wrote a movie, made the movie, it was unbelievable. We talked about the goal of any artistic creation, be it a film, a book, a song, painting, poem, sculpture, whatever—to touch someone. Even just one person. Even if only one person walked away from that experience and remembered it for the rest of their lives, it was worth it. Not every book or story or movie will be a record sales billion dollar experience. Some don’t need to be. Some need only to be read or heard or watched by the right person at the right moment in their life that it changes them. It reminds them they’re not alone. At the time I had no idea that something I’d written had that effect on someone, on someone I knew. It gives you hope. I didn’t think anyone remembered it. I’d only thought about Blinking Eights and ‘Aaron’ a handful of times since then, why would anyone else remember it? Mike did. It stuck with him, it helped express how he felt after Aaron died, and as someone who had known Aaron better then I, and it helped him. I can’t find my copy of Blinking Eights, but I knew it’s around here somewhere. I thought that ‘Aaron’ was lost then to an old computer that’s rotting away up in my attic, but it turns out I had a copy of it after all. I went through it, revised it a little bit. Not much. Just enough to add what needed to be there, what only ten years and a chance encounter with an old friend could add. Maybe it still isn’t any good, but the ending for me was the same. I had the same reaction reading and rewriting it that I had the first time I wrote it ten years ago. I rely on Wikipedia for a lot of things, but have learned use it only as a jumping off point. The articles may give you a decent overview, but who hasn’t found contradicting information within one or hugely uninformative entries altogether? That was the case when I decided to look into Forest Lawn. I wasn’t looking for an extensive history and I didn’t need a book’s worth of information on its life story. I needed just this much information how it came into being and the people involved in that. The Wiki article mentions that Forest Lawn was “founded in 1849 by Charles E. Clarke” and then mentions some notable graves. OK, Wiki, let’s click on that and see just who is Charles E. Clarke? Apparently an individual with no ties to Buffalo whatsoever, at least according to his article. While Wiki mentions that Clarke practice law in Watertown (smallest city to have a park designed by Frederick Law Olmsted) and Great Bend; and that he served as a Whig Representative from New York in Congress beginning the same year he founded Forest Lawn, there was no mention of Buffalo. Before Congress he’d served in the State Assembly from Jefferson County. It says he was born in Connecticut, was educated at Yale and lived at the other end of Lake Ontario for the latter part of his life—what interest did he have with founding a cemetery in Buffalo, and one that he ultimately wasn’t even buried in? I was about to fire off a quick email to a friend who knows a great deal of useless Buffalo architectural information along the lines of “Who the hell is Charles E. Clarke?” when common sense—and the more logical first step—dawned on me: why not see what Forest Lawn has to say about him? But Charles Clarke—focus. He’s only described as a “Buffalo lawyer” but Buffalo is mentioned, so I suppose that’s a win? Its something. In The Dictionary of the United States Congress and the General Government complied back in the day by Charles Lanman, lists him only as a “Representative in Congress, from that state” (New York), but also as having been born in New York. Not Connecticut? So he was a Buffalo lawyer during the most successful period in the City’s history. That’s cool. Apparently he was also enamored with the Pére-Lachaise Cemetery in Paris and decided that Buffalo, with its growing reputation as a national commercial terminus and the literal boatloads of cash making their way into the City, would eventually need a similar resting ground. Like its Parisian progenitor, Clarke’s cemetery was to be built outside the city— 2½ miles outside actually. Think about that: at the time he purchased the land that included rolling hills and bubbling streams, Forest Lawn was originally 2½ miles from the City of Buffalo. Most of what lies within that area didn’t exist. And while that doesn’t seem like a big distance, Delaware Park is less then two miles. When was the last time you walked that? You stopped halfway around didn’t you? No, don’t pretend it was to look at the bison, you couldn’t even make it once around, could you? 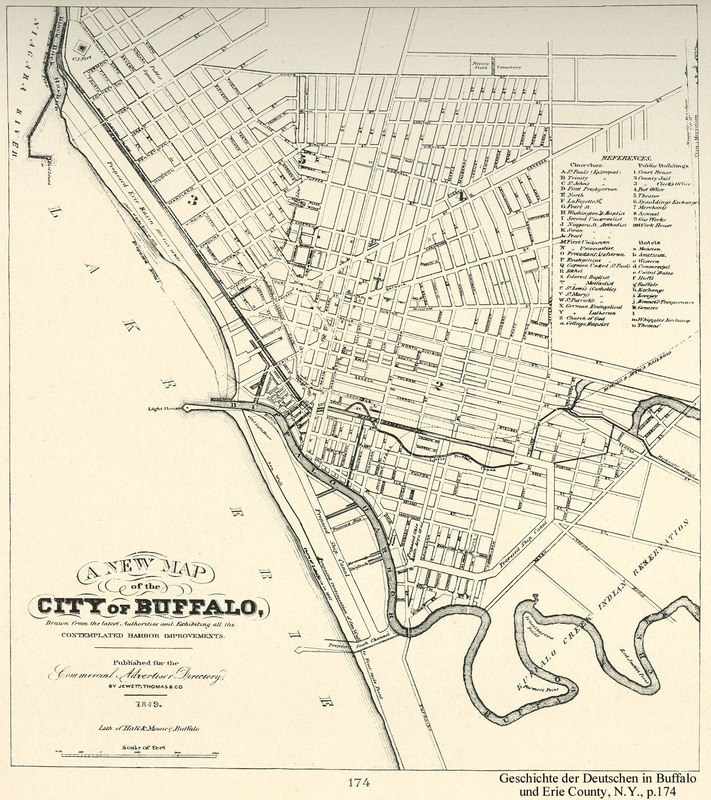 City of Buffalo, 1849In 1832, North Street was the northern border of the City and it wasn’t until 1868 that the border was moved to Ferry Street and the first generation of mansions on what quickly became ‘Millionaire’s Row’ went up. Even then, there was about a half mile between the northern edge of the City and Forest Lawn Cemetery. Like the Pére-Lachaise, the city would soon develop around the cemetery, offering residents a reflective escape from the noisy city streets without having to travel miles to open country. Clarke also found inspiration in Mount Auburn Cemetery in Massachusetts, which looked to Pére-Lachaise as well when it was established in 1831 as America’s first rural or garden cemetery. His remains were moved to Forest Lawn in 1884, which probably explains why he looks so pissed. The first statue in the cemetery was of Red Jacket, celebrating his influence in establishing a relationship between the Seneca and US after the revolution, as well as fighting in the War of 1812 at the Battles of Fort George and Chippawa. That statue was commissioned by personally by Clarke. Today the cemetery features sculptures and monuments celebrating Presidents, industrialists, innovators and businessmen who made Buffalo their home and in doing so created the foundation the City was built on. From its first inhabitant, Joseph Dart, to President and hospital namesake Millard Fillmore and George Birge of the Pierce-Arrow Motor Company, Louise Blanchard Bethune, the country’s first professional woman architect and designer of the Hotel Lafayette, and Albert James Myer, founder of the National Weather Service, the list of figures prominent both nationally and worldwide throughout history who made their homes and livelihoods in Buffalo is impressive. And Rick James is there, too. To paraphrase the Forest Lawn website, the cemetery serves both the living and the dead of the City as an outdoor sculptural chronicle of local history and accomplishment. And, according to Wikipedia, all thanks to a guy who had absolutely nothing to do with Buffalo.